Plz, I need how i get this picture, thanks. Last edited by dead_lord_666 on November 8th, 2008, 12:14 am, edited 5 times in total. You should have it if you've played through HF. Let's see. Without any spoilers... Replay Day 9.
btw, might want to remove that screen shot. A bit spoilerish and about a quarter of the screens in HF are there. Divine wrote: You should have it if you've played through HF. Let's see. Without any spoilers... Replay Day 9. I fix the spoiler tag and the image size. About your tip, I gonna check this day now... give me a little time and I gonna tell you if i have or not this CG. I get the picture, thanks. I'm missing this CG. Anyone can help? "To show me apology I'll do anything she says." 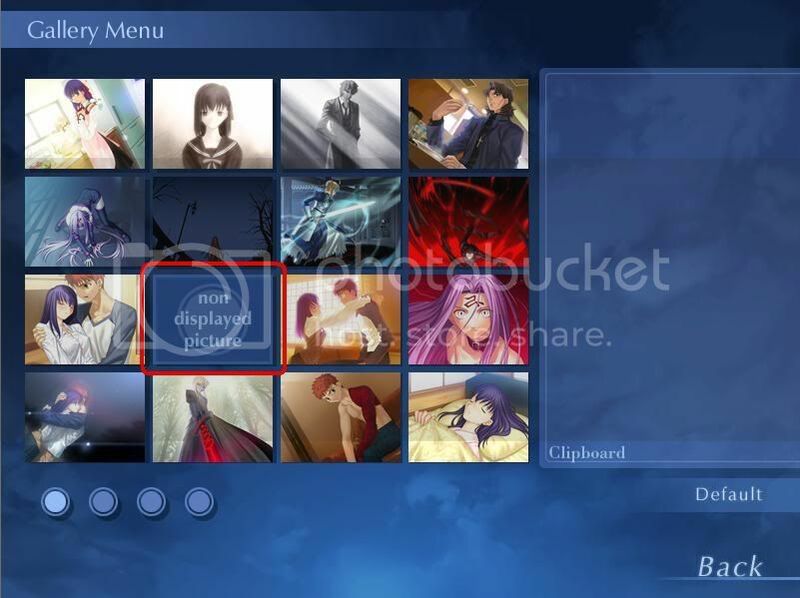 You'll get the missing CG, but the Sakura + Shirou CG won't appear, although the scene will still happen just no CG. It's pretty much you get one or the other CG type of choice. Oh! Thanks to both of you. At least you can always solve that dilemma of 'one or the other' by saving at that choice, pick one until you get the CG, reload and go get the other one. I can't find the last pic in another (not Heaven's Feel gallery). Does anyone know how? Last edited by YoungAloha on November 23rd, 2008, 9:04 am, edited 1 time in total. YoungAloha wrote: I can't find the last pic in another (not Heaven's Feel gallery0. Does anyone know how? Get the stamps for visiting all 40 Tiger Dojos. Go into the Extras menu, ED list tab, and click on the bright colored blob by the tiger. There should be a scene where Fuji-nee and Ilya talk about the game at a hot spring. The last image slot is the pictures from that. In my ED list, 3 pieces of meat are the only things i can click on, see some funny Saber , Rin and Sakura then that pic is still not display. YoungAloha wrote: In my ED list, 3 pieces of meat are the only things i can click on, see some funny Saber , Rin and Sakura then that pic is still not display. Just to make sure. Do you have all endings and everything unlocked besides the last pic in the "another" gallery? Yeah, I have all endings and everything unlocked besides the last pic. Try viewing all of the 'meat' videos. If that doesn't work, you must have missed something -- either a dojo stamp or an ending. Oh man...It is still not display. I am sure i didn't miss anything. If it doesn't work, use the complete save in the FAQ. Game faq doesn't have Fate game save, man. Last edited by YoungAloha on November 30th, 2008, 5:18 am, edited 2 times in total.